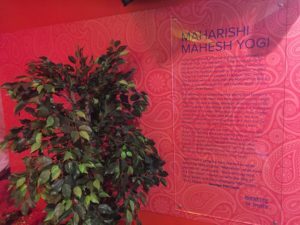 Information about Maharishi Mahesh Yogi which forms part of the India Exhibition at The Beatles Story. Pic © Matty Davies JMU Journalism. A special, immersive exhibition opened at The Beatles Story on Friday, celebrating 50 years since the Fab Four travelled to India. The display boasts an array of original memorabilia, photographs and exclusive personal accounts from the people who were there with the band in the Himalayas in 1968. The trip, which was led by George Harrison, was one of the most productive periods of time for The Beatles, in which they wrote no fewer than 40 songs – many of which featured on the White Album, including ‘Back in the USSR’ and Dear Prudence. The group also spent time undertaking a meditation training course with Maharishi Mahesh Yogi; a famous Indian spiritual guru. This followed the group’s denunciation of drugs in favour of meditation, and their Indian visit received widespread media attention. Jon Kuypers, one of the exhibition’s many visitors over the weekend, called the new display “absolutely fantastic”. The 42-year-old Dutchman told JMU Journalism: “I planned my visit to Liverpool months ago and I was always planning on visiting the Beatles museum, but for me to be here when the new exhibition opened was brilliant. Ravi Shankar’s sitar on display at the India Exhibition. Pic © JMU Journalism. 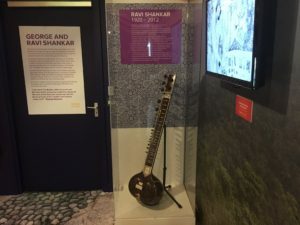 A sitar used by the Indian musician, Ravi Shankar, is also on display within the new immersive area, loaned to The Beatles Story by the Ravi Shankar Foundation. As George Harrison’s mentor, Shankar’s influence on The Beatles ultimately helped to popularise the use of Indian instruments in 1960s pop music.